Tradition has it that gifts of flowers have a special meaning… the special meaning of Orchid is beauty . 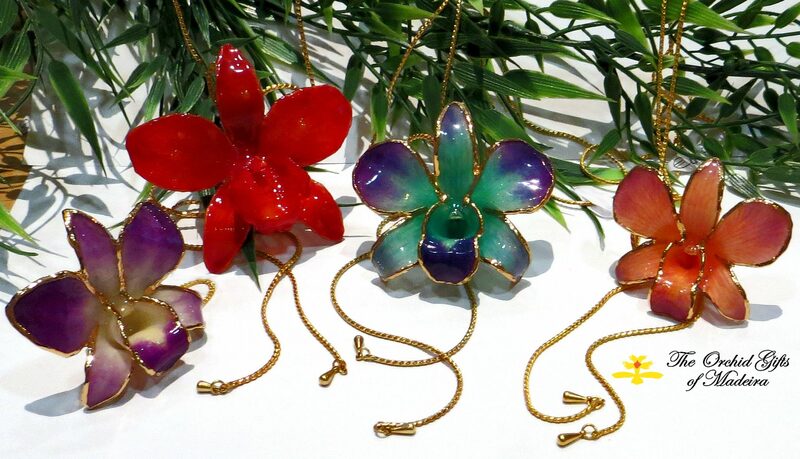 Our Orchid jewellery is made with natural, cultivated Orchids preserved with a specific chemical and finished with resin, goldplating, silver plating or enamel. Some flowers have a thin layer of copper on the back which is electroplated with goldleaf. As a product of nature, no two orchids, even within the same variety, will never be exactly the same. Equally, colors, tones and shades can vary – from lighter to more intensive – depending on the season, but most Orchids have a touch of purple. You may find, the natural colour of your chosen Orchid, differs from the catalogue photo. To help you select your Orchid of choice, we have detailed with each enlarged photo, average natural dimensions and a short description of use. If you do not see what you are looking for on our site catalogue, we welcome you to contact us by email, with your specific request or color preference so we can check our stock and endeavour to meet your needs. All our flowers are lightweight. Resin coat is more resistable than glass, so if they fall, rarely break. As with everything in life, when we wish something to last long, we treat it well. The same rule applies to our flowers and other costume jewellery! In time, laquered Orchids may loose some of their color intensity and take on an “antique” appearance, however if you store them well in a closed box or sachet and avoid spraying with perfumes and hair lacquers, they will give you pleasure for many years, not like flesh flowers which fade away quickly. Silver plated Orchids may tarnish over time if your skin has a high PH. In this case, you should polish your flower gently with a dry, soft cloth after each use and store it in a box. This helps your Orchid shine longer! 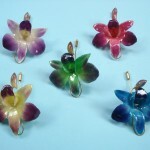 Enamelled Orchids are also natural but painted and with goldplating behind. We truly care about your satisfaction, so whatever your purchase of choice, we warmly wish you an enjoyable, easy and convenient online shopping experience with The Orchid Gifts Madeira. And of course, as and when you visit Madeira, a friendly welcome awaits you at our shop where you can further explore our full range of unique and exquisite jewellery pieces; necklaces, earrings, bracelets, pendants as well as interesting gift items, all beautifully designed with the elegant and stylish modern woman in mind. Error: Error validating access token: Session has expired on Tuesday, 15-Jan-19 07:09:03 PST. The current time is Monday, 22-Apr-19 17:13:35 PDT.